This is John Green's second book of five and the third which I've read. It was a good read but I have to say it's been my least favourite of his work so far. I can't decide if Paper Towns or The Fault In Our Stars is my favourite because they're both great but for very different reasons. 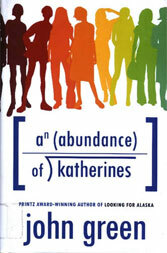 The thing about Abundance of Katherines was that to start with there seemed to be a lot of similarities to Paper Towns but with less relatable characters. I can't put myself in the shoes of a child prodigy very easily and so while the story was fun I was never really emotionally engaged. There were also some moments that didn't really feel all that realistic. As usual I'm probably missing some deeper metaphor but at my level that took me out of the world.